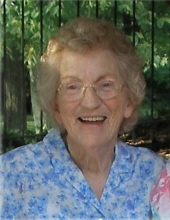 Opal T. Cole, 92, of New Carlisle, Ohio passed away Sunday, March 17, 2019. She was born June 20, 1926 in Mulberry, KY, the daughter of the late Lloyd and Mary Taylor. Opal was a longtime member of the VFW Ladies Auxiliary. She loved square dancing with her husband and quilting. Opal is preceded in death by her husband Vestal Owen Cole; daughters Doris Dysinger and Connie Evans; and grandchildren Eric and Stevie. She is survived by her son William “Bill” (Lisa) Cole; a sister Rose Wilson; son-in-law Dave Dysinger; grandchildren Natalie, David Jr., Greg and Jeremy; and ten great-grandchildren. Visitation will be held Friday, March 22, 2019 from 5-8 PM at Croley Funeral Home. The funeral service to honor Opal will be Saturday, March 23, 2019 at 11:00 AM at the Croley Funeral Home Chapel. Following the Service she will be laid to rest in the Slusher Cemetery. Arrangements in Ohio have been entrusted to Trostel, Chapman, Dunbar & Fraley Funeral Home. Expressions of sympathy may be made at www.trostelchapman.com. To send flowers or a remembrance gift to the family of Opal Taylor Cole, please visit our Tribute Store. "Email Address" would like to share the life celebration of Opal Taylor Cole. Click on the "link" to go to share a favorite memory or leave a condolence message for the family.